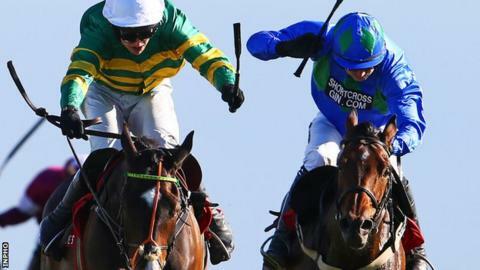 The younger legs of Jezki won the day at Punchestown as Jessica Harrington's seven-year-old beat rival Hurricane Fly in Thursday's World Series Hurdle. The 11-year-old Hurricane Fly had got the better of his opponent on each of their four previous meetings this year. But this was the first time both horses had tackled three miles. Mark Walsh claimed the win on board Jezki, with Hurricane Fly, a winner of 22 Grade One races, a length and three-quarters back, with Zaidpour third. "There may be more than 10 months to go until the 2016 Cheltenham Festival, but I'm already excited about the prospect of Jezki tackling the World Hurdle. Of course we already know he's good, but, trying three miles for the first time, he absolutely excelled. "Hurricane Fly, also making his distance debut, seemed to last alright, just not as well as Jezki. Until last weekend, AP McCoy would have ridden the winner. On days like these, agony must go through his head." Jezki (5-2), winner over two and a half miles in the Aintree Hurdle last time out, travelled noticeably well in the hands of Mark Walsh. Ruby Walsh, on the other hand, never appeared totally content aboard Hurricane Fly, who made one or two uncharacteristic jumping errors. Class rose to the top before the home turn, with the big two leaving their rivals trailing. The JP McManus-owned Jezki had more in the tank and the Willie Mullins-trained Hurricane Fly was unable to bridge the gap. "He travelled too well if I'm honest," Mark Walsh said of Jezki. "He settled fine early but something lit him up. He's some horse to win despite that. His class got him through."